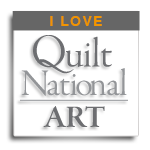 Quilt National artist Brigitte Kopp received the Fine Art Quilt Masters 2014 award at the Festival of Quilts in Birmingham. The juried show is an international competition. The show strives to include the very finest examples of art quilts. 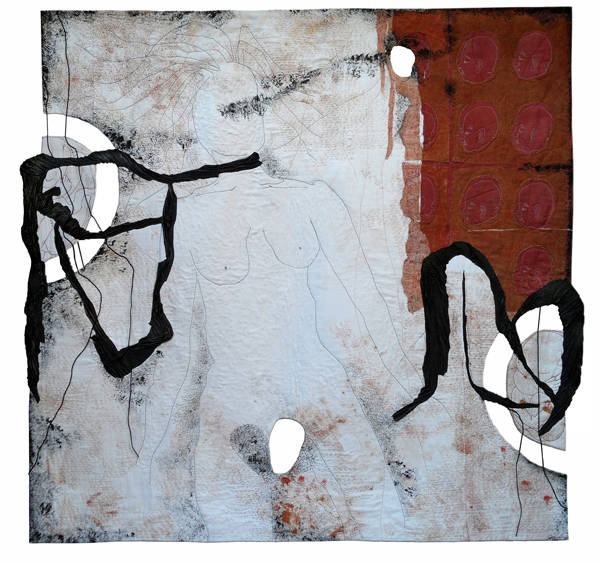 Her quilt, Gebärmütter, is part of a series of works, Perception of Women, focusing on the role of women in society and the choices they make. It includes a recycled cotton bed cloth, net, latex, ropes, painted whole cloth that is hand and machine quilted and embroidered. There are different perceptions of women in our society depending on their tasks or the task people allocate to women. One is to have children…The German word for wombs? Gebärmütter – designates the organ as well as women, having more and more children. This piece focuses on the struggle women have making decisions about contraception and abortion.